UPDATED (5/24): Updated with NEW location for presentation and site tour CANCELLED. The Department of Recreation, Parks and Cultural Activities (RPCA) invites the public to attend a workshop to obtain community input on the Simpson Park playground and adjacent lawn renovation on Wednesday, May 25. There will be a presentation, review of concept alternatives and discussion at 7:00 pm at the Mt. Vernon Rec Center, located at 2701 Commonwealth Avenue in Alexandria, Virginia. RPCA hired the Alexandria-based landscape architecture firm Lardner/Klein to lead the design process and May + Watkins to incorporate public art within the site. The project implements recommendations from the 2014 Citywide Parks Improvement Plan, which called to (1) improve the open space to accommodate multiple passive uses and activities in Simpson and (2) renovate Simpson playground, including a new configuration, shade, surfacing, and equipment suitable for ages 2-12. The design also aims to connect passive use areas, making it family friendly for multiple age groups. Attendees will have an opportunity to learn about the initial process for the park and playground renovation and provide feedback on three alternative concepts for the site and public art. This project is funded through a Land and Water Conservation Fund grant and matching City Capital Improvement Project funds. 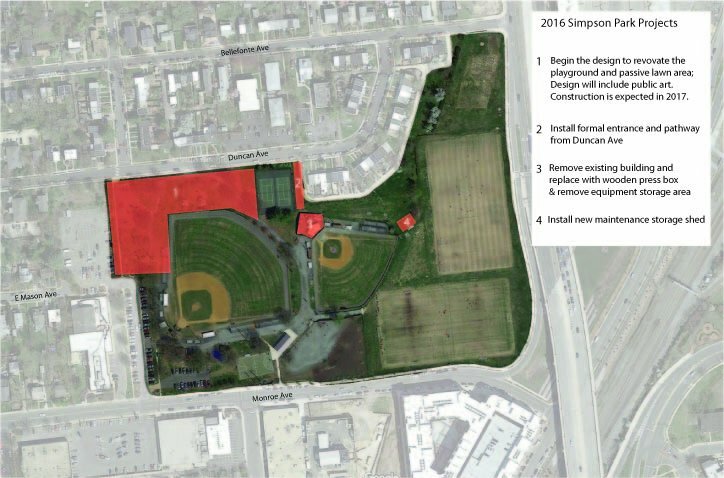 If you are unable to attend the meeting, you can provide input on the three alternative concepts from May 25 through June 8 on the Simpson Park Playground and Passive Lawn Renovation project website. For additional information, contact Dana Wedeles, Park Planner, at 703.746.5491.